A young man named Francis recounts a fantastic story taking place in a North German town where a number of brutal murders have been occuring. Francis and his friend, Alan, visit a traveling fair where one of the acts is a certain Dr. Caligari's presentation of a hypnotized sleepwalker named Cesare who can tell the future. Cesare predicts Alan will be dead by the next morning, and he is in fact murdered in the night. Franics becomes suspicious of Caligari and Cesare, but another man is incorrectly blamed with the crimes. 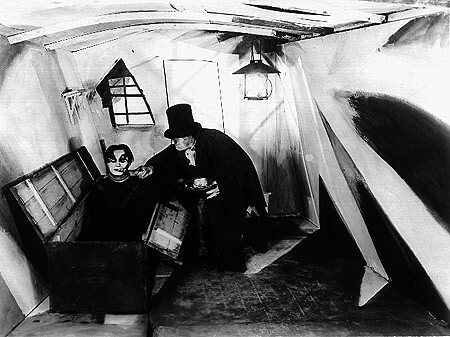 However, Cesare later abducts Francis's fiancee Jane, and it becomes evident that Caligari was commanding the sleepwalker to carry out the murders. Francis chases Caligari into an insane asylum where it turns out Caligari is the director who has himself gone mad. Dr. Caligari is captured and incarcerated in his own institution. The flashback ends, and it turns out Francis is actually a patient in the asylum, as are Jane and Cesare. The benevolent Dr. Caligari is the director, and he states that Francis suffers from peculiar delusions. One of the first and most famous examples of German Expressionism, The Cabinet of Dr. Caligari achieves most of its effectiveness and importance from brilliant mise-en-scene, primarily in the area of set design. The sparseness of its narrative form, while adding to the overall mysteriousness, marks the film as a relatively early work in the development of cinema; there is a general lack of camera movement and very little editing within scenes. Fortunately, the somewhat dated elements of the film’s technique are unorthodox enough to maintain the avant-garde feel of the picture and not to distract from the stylish aesthetic form. Its lasting ability to interest contemporary viewers makes it easy to understand the film’s wide influence, extending beyond Expressionism directly to the horror genre and to films depicting a darker side of the psyche. The fantastic stylized sets capture the subjective perceptions of the main character by shaping the scenery from his thoughts, an important cinematic innovation. One of the most memorable aspects of this famous décor is the number of acutely angled shapes and pointed objects sprinkled throughout; it has to be one of the most jagged set designs in film history. This characteristic subtly reminds one of the stabbings Cesare carries out at the bidding of Dr. Caligari. These sharp geometric figures also convey a pervading sense of danger and evil throughout the city which, in retrospect, can be seen as the paranoid worldview of the narrator. Interestingly, the two areas that are relatively devoid of these sharp lines are Jane’s house and inside the insane asylum where rounded designs prevail. These places where comfort and normality should preside are both threatened in the inner story. Of course, all of the events and settings within this framed narrative can be explained functionally by Francis’ psychosis, but the images should be seen in their own aesthetic terms as well. For instance, the crooked asymmetry of the windows and other objects in various scenes signifies the narrator’s skewed view of reality but are also visually striking and pleasantly different. Cesare’s carrying off of Jane over crooked buildings and their trek through a twisted forest are also memorable representations of a distorted vision of the world. Other stylistic aspects also add to the eeriness and originality of the film. The Expressionistic touches were not restrained to the sets but extended to make-up and some of the acting, most notably Cesare’s in both cases. His pallid complexion and the exaggerated dark circles under his eyes set the standard look for movie zombies. Cesare’s slow awakening to a wide-eyed look into the camera is somewhat frightening, partly because it’s one of the only close-ups. His approaching of Jane’s house by walking jerkily and as if he is plastered to a nearby wall adds to the strange mood. The self-conscious graphic design is evident in a shot of Dr. Caligari waiting on the town clerk; three streaks run prominently through his hair and are matched with three distinct lines on his glove. Another example would be Francis waiting in the empty hall of the asylum, standing directly in the center of an alternating black and white circle to form a memorable tableau—much like an Expressionistic painting. In fact, most of the film is shot in these medium long shots which allow the surrounding décor to be fully seen and require the viewer’s eye to study the entire frame. A few iris-in effects that jump to the extreme side of the frame hint that important elements reside throughout each composition. Multiple viewings undoubtedly yield a greater appreciation of all the telling mise-en-scene details that create the film’s unique atmosphere. The German filmmakers were not allowed to see American films during the years when D.W. Griffith significantly expanded cinema’s vocabulary; there would be none of the intricate editing present in Intolerance. But, again, the film’s extraordinary art direction prevents one from complaining that shots are held too long. The lack of editing even pays off in some instances such as the frightening shot of Cesare coming into Jane’s bedroom from a window at the back. The depth in this shot allows the approaching somnambulist to penetrate the previously tranquil space surrounding Jane as she sleeps. The monster/killer preying on the unsuspecting or helpless female as illustrated here became a standard horror cliché. Although Caligari’s narrative presentation is not as complex as Griffith’s during this period, it does manage to relate a story with interesting implications. The framing story, suggested by Fritz Lang, that turns most of the film into a delusional flashback affects the film in a myriad of ways. Much of the subversiveness is drained away, and questioned authority is returned to its position of power--perhaps not a good message for a nation coming out of a losing war and soon to be entering another one. Nevertheless, even though Dr. Caligari ultimately is shown as benign and helpful, the impact of the rest of the film is powerful enough to cause some doubt at this resolution. Maybe Dr. Caligari really did commit those evil deeds but used his power to manipulate things and to create an ‘official story’? This reading encourages even more political metaphors, but Cesare’s changed appearance and behavior in the asylum belies it. However, it’s interesting to note how the film argues so strongly for its internal, Expressionistic view that the final objective reality is questionable; illusion has become reality, in cinema and perhaps in life. Although (and because) the opening of the film is somewhat cryptic, I didn’t recognize the narrator’s mental state until the conclusion, when the opening and stylized bulk of the film are given causality. This ending twist that explains the preceding film can be seen in later movies such as the low-budget but effective Carnival of Souls and more recent shaggy-dog stories like The Usual Suspects. It’s difficult to say whether the framing story adds or detracts from the overall effectiveness. Without it there might have been a greater mystery or strangeness to the film with little diegetic explanation for its twisted vision. But, as it stands, the more logical explanation that we have been viewing things formed in an insane mind is not that comforting. This film, along with other similar German works that followed it, profoundly influenced genres such as horror and film noir where stark lighting effects turn regular objects into Expressionistic shadows. Caligari feels closest to the dark world of psychological horror, embodied in later instances such as Psycho and (especially) Roman Polanski’s Repulsion. Most importantly, while many features during this time tended toward documentary-like objectivism, Caligari showed that film could present the subjective as well, opening up new realms of poetic and psychological exploration.